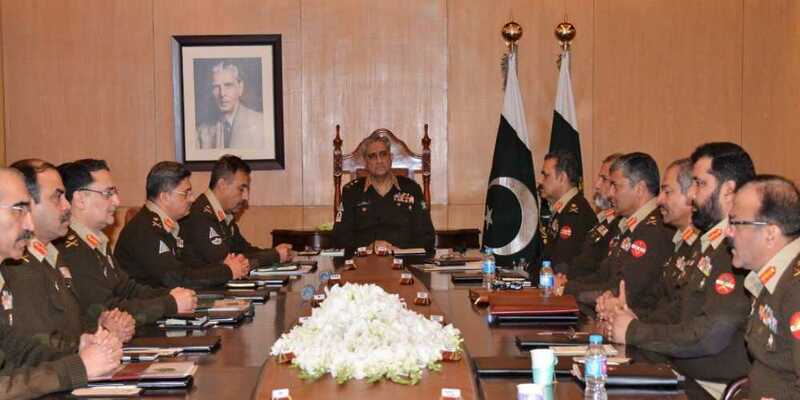 Presiding over the 216th Corps Commanders’ Conference held at the general headquarters (GHQ) of the Pakistan Army in Rawalpindi, the Chief of Army Staff (COAS) General Qamar Javed Bajwa on Thursday reassured all out support of armed forces to state institutions to ensure a peaceful and progressive Pakistan. “We shall continue to support all state institutions for peace, stability and progress of the Country in best interest of the people of Pakistan,” the COAS said. The forum reviewed geo-strategic environment with special focus on regional security and situation on eastern and western borders including Line of Control (LoC). The progress of ongoing stability operations for internal security was also discussed. The forum highlighted importance of regional approach to eliminate roots of terrorism and attached hopes for success of ongoing Afghan reconciliation process while supporting all stakeholders to bring Afghan war to a peaceful logical conclusion. It also pledged to safeguard against all external threats while consolidating gains of counterterrorism military operations which have put the country’s security situation on a positive trajectory for socio-economic progress and development.